Begin by folding the 4 letter size colored paper. The fold should form a triangle. After having formed the triangle, use the pair of scissors to trim off the extra paper and create a square piece. Open up the square and again fold it in the middle to form a rectangle. Fold the rectangle once more at the middle and form a square. Fold the square diagonally once more and form a triangle. Fold the new triangle at the middle and create a right angled triangle. Take the pair of scissors once more and use it to trim off the extra paper. On the edge of the right angled triangle, use the pair of scissors once more and cut in half a circle shape. Measure half a centimeter, use the pair of scissors once more to cut off another half circle shape. Once more leave yet another one and a half centimeters and use the pair of scissors to cut another half circle. Connect the new circle to the previous half circle you cut just a minute ago. Place the pair of scissors on your work station and carefully start opening the petals. From one sheet of 4 letter sized colored paper, you should create two sets of flowers. Now pick yet another 4 letter sized colored paper and repeat the steps above. When you reach the step of cutting out half circles, begin by leaving one and a half centimeters and cut off half circle shape to form a smaller flower. You should now have two big flowers and two smaller fuller flowers. Place once small flower on the work station, spread it out and place the small candle jar on top. Use a pencil to create a circle around the small jar holding the candle, on top of the smaller flowers middle section. Take out the jar and start bending the petals inwards to make them stand in an erect position. Repeat the same process on the other smaller flower as well. Just don’t bend the second flower petals too much, bend them just a little to rise half a centimeter and place the first smaller flower inside this flower and form the rows of flowers that bloom. The other two fuller flowers on your work station should be worked on next. 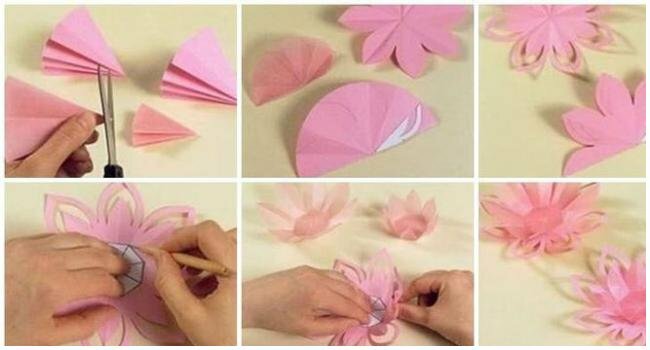 Start by folding the paper in the middle, following every shape of petal. Start folding the petals in the middle, one by one till you finish. Repeat the same process on the remaining fuller flower. Now arrange the flowers by their size the biggest size going to the bottom of the flower, until you reach the smallest flower. Apply glue on the base of the smallest flower that is on top and stick on the candle jar. 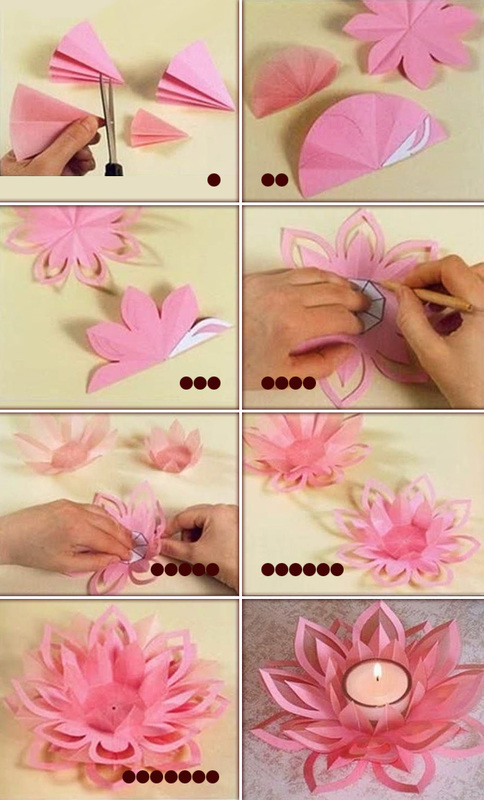 Light up the candle and your DIY Paper Lotus Candleholder is complete! Enjoy!! !